Oil on canvas 17 x 13 in. 43 x 33 cm. Professor Giancarlo Sestieri has suggested the authorship of the Battaglioli for the architecture and Fontebasso for the figures in this work. The career of Francesco Battaglioli is relatively well documented in contemporary sources, both as a vedutisto and as a painter of theatrical scenery. After studying with Raffaello Rinaldi in Modena he entered the Fraglia Veneziana in 1747 which launched his career as a painter of vedute. His views of Treviso and Brescia already had sufficient quality to be engraved by Francisco Zucchi, and on the reputation of these he followed the familiar path of many Italian artists of the time by journeying to Madrid in 1754 to work for Ferdinand VI. His output in Spain consisted largely of theatrical scenery for the royal court theatres, supervised by the famous castrato Farinelli. Scenery painting in the eighteenth century was a highly respected genre and engaged the talents of several distinguished painters, among them Servandoni in Paris. While in Madrid Battaglioli also executed views of court life, but his career there was cut short by the death of Ferdinand and he returned to Italy around 1760. His prospects however were revived by his nomination as a member of the Accademia di Belle Arti in Venice in 1772, and his subsequent appointment as professor of perspective to succeed Antonio Visentini, another vedutisto, which lasted from 1778 to 1789. In addition he was still executing views of seaports and naval battles well into the 1780’s. Fontebasso was one of the leading rococo painters in 18th.century Venice, a pupil of Sebastiano Ricci and subsequently influenced by his great contemporary Gian Battista Tiepolo. He visited St.Petersburg in 1761 to contribute decorative schemes for the WinterPalace, and returned in 1768 to execute frescoes for the church of San Francesco della Vigna in Venice. His fluent, impasted technique is evident in the figure painting here. 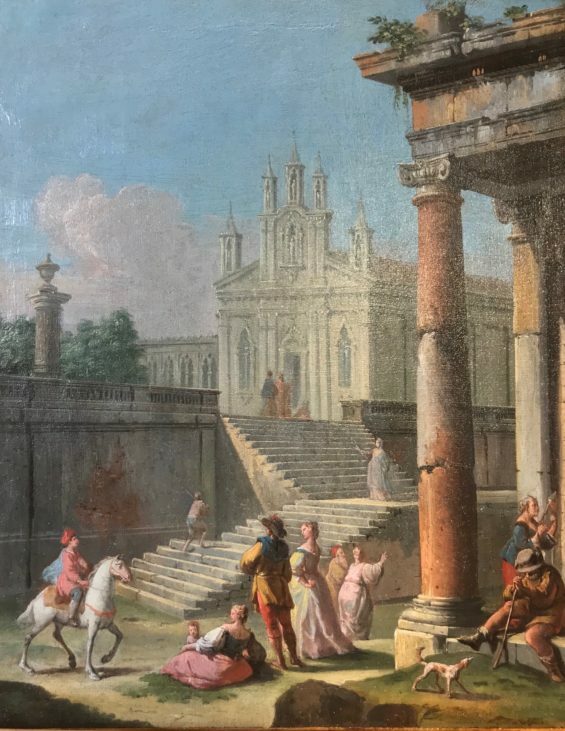 I am writing to enquire about "An Architectural Capriccio with steps leading up to a Church and elegant figures beside a Colonnade on the right"